Today my first PCBs arrived. Hooray! For me, this is definitely like reaching the next level in DIY technologies. I chose three simple circuits that I wanted to be produced. After some research I decided to go with Olimex, a PCB service in Bulgaria. They are offering a very good price even for small quantities. A double sided PCB with 160mm x 100mm costs 30 â‚¬. And you can have multiple layouts on one board. So I made up my eagle files and produced gerber files. I had to adjust the precision for drilling (EXCELLON step) according to the FAQ. Next, I zipped all gerber files and a readme file and send it to Olimex. As this was my first order, it took some time and several emails until everything was ready for production. First I didn’t check exactly if my circuits fit on the board as I layed them out. Second I designed a custom part, an LED matrix, in Eagle. That part had circles all over to represent every LED. But that confused Olimex and they thought something went wrong when I did the gerber files. They confirmed that now everything was ok with my files and that they were ready to go. I received a PDF which I had to print and fill out with my address and credit card details. That print out had to be faxed back to Olimex. Hmm, that looks a bit like 1996 to me. I would prefer to do everything online, including the payment. After they received the payment, it took 5 work days for them to finish my boards and it took another 4 days until I received my boards here in Hamburg. After all it cost me 52 € for my 11 boards. Thats including VAT, shipping and some extra euros for correcting my errors. The price is still ok, I think. And if I had been more precise with my layouts, it would have been faster. Olimex did a great job in supporting me with my first order. Friendly and fast. Maybe I will try out other PCB houses as well, but I suspect that Olimex is one of the better ones. This entry was posted in avr, PCB by alex. Bookmark the permalink. Thats a great resource, since i live in Romania near Bulgaria, but i recently got my hands on a cnc machine, and together with my UV pcb fabricating skills, im not gonna need any commercial PCB fab services. Olimex are certainly fairly nice, although I’ve not used them yet – mainly because of the whole printing out an order form and faxing it in business that you mention. They’re also one of the few places that require hole sizes to be pre-plating, whereas most fab houses will account for plating thicknesses. You might want to look at BatchPCB (run by SparkFun), which do double sided with double sided silkscreen and soldermask for $2.50/sq.in, or â‚¬40 for your 160×100 board (although with longer lead times). I’ve also looked at pcbpool and pcbcart, both of whom have fairly good deals on small quantity orders. thanks for the input. I think Sparkfun will be the next on my list. Everything is online and fairly painless, plus, if you are a student I believe they still offer a discount for that (you also get a free pizza and 2 liter soda as well, hoorah!). Turn around is fast and they are pretty cheap. Thanks for the tips. 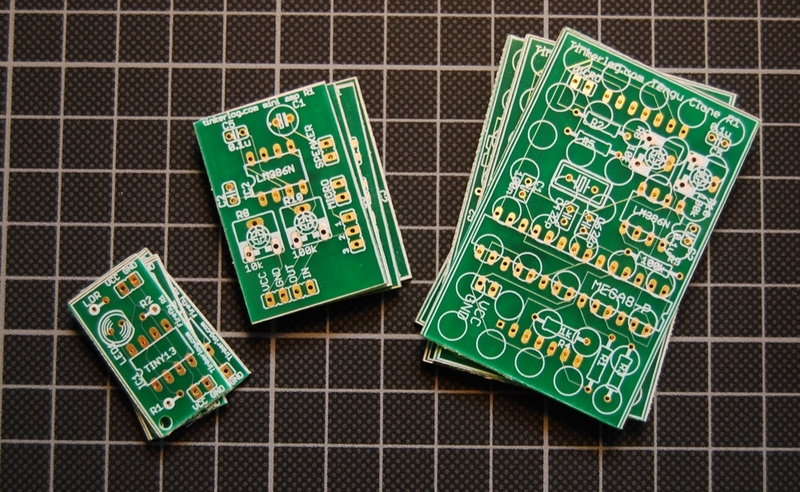 I was planning to use BatchPCB at some point, as the price looks pretty good. I priced out a 2.2″x1.8″ board for my SP0256-AL2 speech chip circuit at US$20 ~ $12.50 â‚¬ (incl setup fee). Planning to have a PCB made for real once I add an AVR to the circuit for simplified interface (and to do TTS??). Pingback: DIY - How to build your own Tengu! | zedomax.com - The Coolest DIYs, Hacks, Gadgets, Web2.0,and Internet Marketing. we do a lot of embedded work, this input is going to be useful for us as well. …seems like the international industries have improved in recent years, however, so I’ll def. bookmark the guys you used.